Basically there are 8 questions and instead of typing them out you hand write them! 1. What's your name / blogger name? 2. What's your blog's URL? 6. Your favorite band / singers? 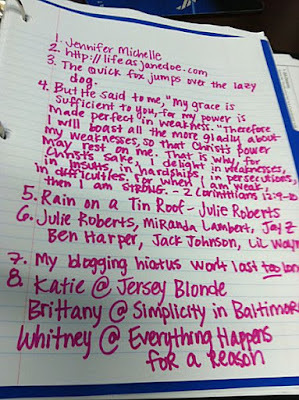 Girl, you have great handwriting! I hope your funk fades soon, I'm thinking of you!